They say that if you can remember the 1960s you weren’t there. By contrast if you lived in London you will never forget the dynamic decade of the 1980s (even if you can’t remember the name of the current Prime Minister). The period of the Thatcher government (1979-1991) is rightly known for taking on the culture of perpetual strife promoted by the labour unions and, as many of us saw it at the time, enabling an era of private capital investment and personal wealth opportunities. What is probably less well remembered is that the Thatcher years were bookended by high inflation. Inflation was 18% in 1980 (stoked more by OPEC than the NUM) and, having moderated in the middle of the decade, was back up to 9.5% in 1990 (arguably stoked by Nigel Lawson). By 1993, inflation had fallen to just 1.6%. This was extremely unusual because the UK had been growing with a distinct inflationary bias since the Second World War. From 1946 to 1992 the average annual inflation rate was 6.8%: that’s the best part of 50 years in which people’s expectations were absolutely tuned in to higher prices. No doubt it is for this reason that people born before c.1970 have typically been waiting for the re-emergence of inflation ever since. The average inflation rate in the last 25 years has been 2.8%. People’s expectations have changed and are now more tuned in to stable or even lower prices. It is quite logical that inflationary and deflationary expectations affect behaviour. If you expect prices to rise constantly you will not defer purchases: you might even borrow to fund your spending. But if you expect prices to fall you will sit on your cash until you absolutely need to buy. The inflation hounds are running out of hares to chase. 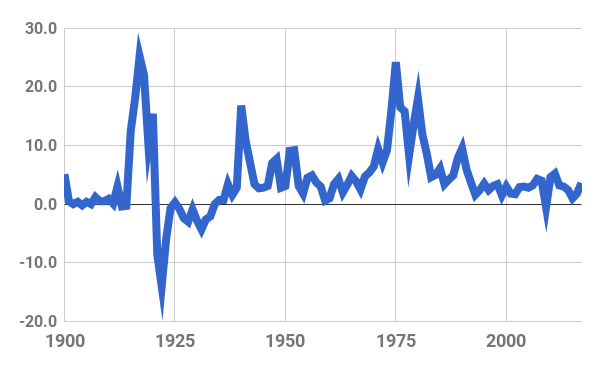 Bootle makes a great point here which I will restate slightly with the help of this chart of the annual inflation rate since 1900 (click to enlarge). The chart shows three major inflationary shocks since 1900: two world wars and then the notorious (to those who remember it) inflation of the 1970s. These were extreme examples of what Bootle calls “conflict between different interest groups”. The inflation of the 1970s was marked by oil shocks that happened as a result of events in the Middle East; the Arab-Israeli war in 1973 and the Iranian revolution in 1979. But inflation had been a problem in the UK for most of the 1950s and the 1960s. I have read a couple of pieces about this recently. One was a chapter about Walter Monkton in Andrew Roberts’ book Eminent Churchillians. Monkton, whose personal sympathies were somewhat left of centre, was appointed as Minister of Labour by Churchill in 1951. His brief was to preserve industrial peace. Shocked by the landslide Labour victory of 1945 the Conservative party had moved to the left (much as it is doing now). Roberts says that the trade unions, representing the workers in newly nationalised industries, “had been accorded a quasi-governmental role”. With the amiable Monkton establishing cordial relations with all the union leaders, all pay disputes were resolved by the government accepting honourable defeat. The union leaders themselves began to be outflanked by their own shop stewards who were more radical and called strikes on the basis of a show of hands rather than a secret ballot. In 1953, when inflation was 3.1%, a number of important unions put in 15% wage claims. Not only did the elderly Churchill and his wet cabinet colleagues have no stomach for a fight but the workers also knew that when the state was their employer, it could always afford to pay. Forward to 1969 and Labour had been back in power for five years. It had attempted to control wage rises with a Prices and Incomes Act but met with constant opposition. Barbara Castle (now more happily remembered for the Equal Pay Act thanks to Made in Dagenham), published a white paper hubristically called “In Place of Strife”. It set out in painful detail the Labour administration’s attempts to reason with the unions over such topics as registration of unions, rules about striking and workers’ complaints against the union itself. Pausing only to wonder whether it is possible to be implacable and emotional at the same time, reading on it becomes clear that the simple response of the union movement was that it would “put its house in order without public supervision”. In short, “Bugger Off”. The result was that the Labour cabinet naturally caved or, if you prefer, betrayed Barbara Castle and in 1970, to general surprise, the UK electorate told Labour to bugger off and a decade or more of bitter and economically crippling hostility began. As I have said, it took more than twenty years before inflation could be said to have been defeated. It takes a long time to change expectations. So, forward once again to 2018. Yesterday Philip Hammond made his spring statement in which he said that the Office for Budget Responsibility is now forecasting that inflation will fall from 3% back to the target rate of 2%. It would appear that the wait must go on. So what, if anything, could wake the dozing monster? The first answer is extremely unpleasant – World War III. Investment is about probability rather than outcomes but I am not positioning for that yet. The second answer is at least worth looking at – Labour’s clunky proposals to nationalise energy, water, rail and – really bizarrely – mail delivery. Remember that the government is an employer that can always pay up and history teaches that it usually will to avoid strikes in key public services. You may think and I do think that these proposals both smell and bark like a dog but let us not get distracted by an attachment to our own view of the world. We are dealing with populism here and the first rule of populism is that complacent know-alls like me don’t get it. The collective memory of ‘quasi-governmental’ unions and double-digit inflation has faded into folklore. Maybe we will get fooled again. If the Corbyn circus looks like erecting its tent in 10, Downing Street, my first piece of advice is to protect your investments against the return of inflation. My second piece of advice will be how the hell you do it…..I can’t wait to read that to find out what it says…..